While many features and capabilities of Red are familiar to people who have used social networking sites and blogging software, there are also quite a few new concepts and features that most people have not encountered before. Some of the new ideas are related to the decentralized nature of the grid; others are associated with the advanced permissions system that is necessary to protect your data privacy. The purpose of this guide is to help you understand how to create, configure, and use your nomadic identity. Not all Red sites allow open registration. If registration is allowed, you will see a "Register" link immediately below the login prompts on the site home page. Following this link will take you to the site Registration page. On some sites it may redirect you to another site which allow registrations. As all Red sites are linked, it does not matter where your account resides. Enter a password of your choice, and repeat it in the second box to ensure it was typed correctly. As Red offers a decentralised identity, your account can log you in to many other websites. Once you have done this, your channel is ready to use. At https://hz.macgirvin.com/channel/username you will find your channel "stream". This is where your recent activity will appear, in reverse chronological order. If you post in the box marked "share", the entry will appear at the top of your stream. You will also find links to all the other communication areas for this channel here. The "hamburger" menu in most themes will provide you with navigation to other system components and apps. The Photos page contain photo albums, and the Events page contains events share by both yourself and your contacts. Red has unlimited profiles. You may use different profiles to show different "sides of yourself" to different audiences. This is different to having different channels. Different channels allow for completely different sets of information. You may have a channel for yourself, a channel for your sports team, a channel for your website, or whatever else. A profile allows for finely graded "sides" of each channel. For example, your default public profile might say "Hello, I'm Fred, and I like laughing". You may show your close friends a profile that adds "and I also enjoy dwarf tossing". Then select "Edit Profiles" from the menu of your Red site. You may edit an existing profile, change the profile photo, add things to a profile or create a new profile. You may also create a "clone" of an existing profile if you only wish to change a few items but don't wish to enter all the information again. To do that, click on the profile you want to clone and choose "Clone this profile" there. The "Grid" page contains all recent posts from across Red network, again in reverse chronologial order. The exact posts that appear here depend largely on your permissions. At their most permissive, you will receive posts from complete strangers. At the other end of the scale, you may see posts from only your friends - or if you're feeling really anti-social, only your own posts. Connections in Red can take on a great many different meanings. A connection is more accurately defined as a set of permissions that you have granted to somebody else. In traditional social network applications, all connections are granted the same permissions; or at most there two levels (friends and 'followers'). In Red, a range of separate permissions may be set/adjusted depending on the siutation and relationship you have with the other channel. You can allow somebody to view your posts but not your photos. You can also deny them permission to comment on your posts or send private mail to you. But let's keep it simple, you want to be friends with somebody like you are familiar with from social networking. How do you do it? The next thing you can do is look at the Directory. The directory is available on every Red website which means searching from your own site will bring in results from the entire network. You can search by name, interest, location, and keyword. Permissions in Red are more complete than you may be used to. This allows us to define more fine graded relationships than the black and white "this person is my friend, so they can do everything" or "this person is not my friend, so they can't do anything" permissions you may find elsewhere. Anybody in Red will have this permission approved. Even complete strangers. However, anybody not logged in/authenticated will have this permission denied. This allows you to share a file, folder, photo, album, or channel with a specific person or group of people. They don't need to be Red members. You can set an expiration for the Access Token. 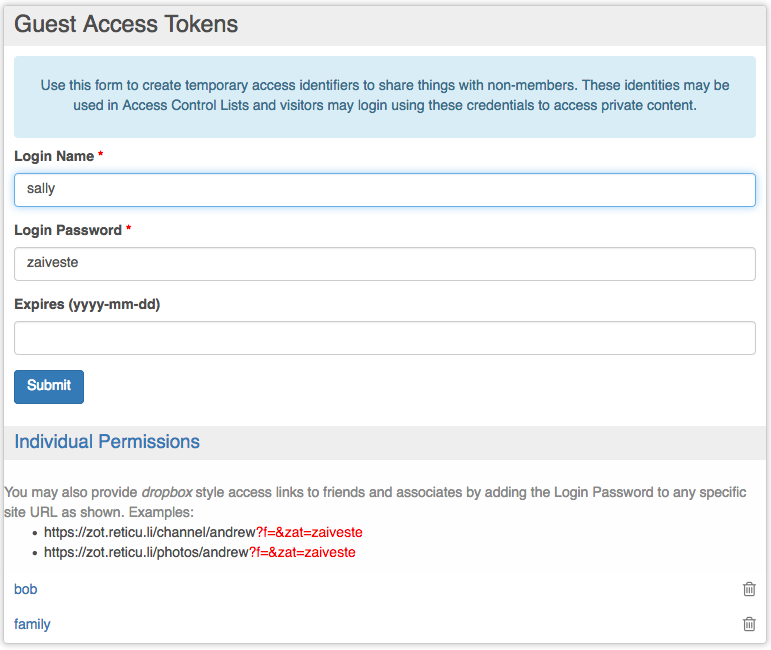 Guest access tokens (sometimes called "Zot access tokens") allow you to share a file, folder, photo, album, or channel with a specific person or group of people who are not Red members. These tokens allow you to share individual items by sending a link that includes the token in the URL; alternatively, people can actually log in using the token credentials, after which they can seamlessly view whatever content has been shared with that token. Red supports several markup languages for advanced formatting of content. The default markup language is a custom variant of BBcode, tailored for use in Red. BBcode is supported for posts, wiki pages, and web page elements. Wiki pages and webpage elements may also be written using standard Markdown. Like many other platforms, Red uses a special notation inside messages to indicate "tags" or contextual links to other entities. Red allows members and allowed connections to create static webpages. To activate this feature, enable the Web Pages feature in your Additional Features section. The condensed notation isn't part of Comanche itself but is recognised by Red platform as a theme specifier. Red provides an ability to store privately and/or share arbitrary files with friends. To delete attachments or change the permissions on the stored files, visit https://hz.macgirvin.com/cloud/username replacing username with the nickname you provided during channel creation. Your files are visible on the web at the location https://hz.macgirvin.com/cloud/username to anybody who is allowed to view them. If the viewer has sufficient privileges, they may also have the ability to create new files and folders/directories. This should only be used for smaller files and photos (up to a few megabytes) as it uses internal memory. For larger files (videos, music, etc. ), please upload using WebDAV. These files may still be retrieved via web access. When using WebDAV, the file is created with your channel's default file permissions and this cannot be changed from within the operating system. It also may not be as restrictive as you would like. What we've found is that the preferred method of making files private is to first create folders or directories; then visit https://hz.macgirvin.com/cloud/username select the directory and change the permissions. Do this before you put anything into the directory. The directory permissions take precedence so you can then put files or other folders into that container and they will be protected from unwanted viewers by the directory permissions. It is common for folks to create a "personal" or "private" folder which is restricted to themselves. You can use this as a personal cloud to store anything from anywhere on the web or any computer and it is protected from others. You might also create folders for "family" and "friends" with permission granted to appropriate privacy groups. 4. Type 'https://hz.macgirvin.com/dav/nickname' in the textbox (replace nickname with your channel nickname) and click the Complete button. 5. Type your Red channel nickname. IMPORTANT - NO at-sign or domain name. Where https://hz.macgirvin.com is the URL of your hub, /mount/point is the location you want to mount the cloud, and <DesktopUser> is the user you log in to one your computer. Note that if you are mounting as a normal user (not root) the mount point must be in your home directory.